Nationally-known leaders have called Diane L. Redleaf the “conscience of the child welfare system,” the driving force behind creating a “better, fairer child welfare system” and “the people’s lawyer.” A civil rights lawyer for families in the child welfare system since she settled in Chicago in 1979 after graduating from Stanford Law School, Diane has played a leading role in hundreds of important cases on behalf of families, with over 60 published court opinions. She has also led legislative efforts that have benefited millions of children and families. Her litigation and legislative advocacy has created due process remedies for wrongly accused family members and created social service and housing support models for families throughout the United States. Diane has worked on dozens of friend of the court briefs in federal and state courts, including the United States Supreme Court. 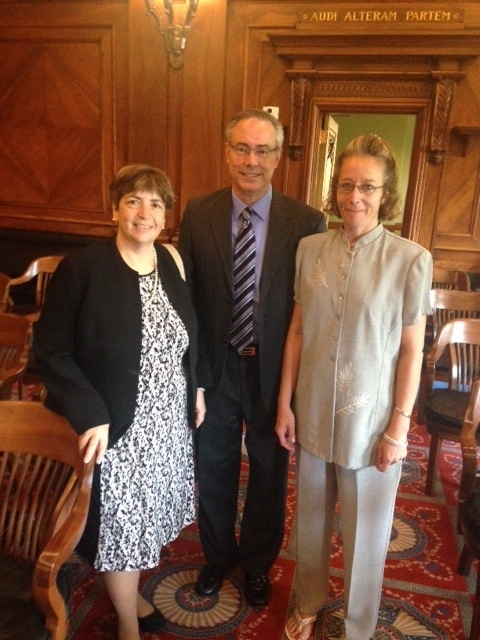 Here she is pictured with Louis Milot and his client Heather M. at Louis's successful argument on Heather's behalf at the Illinois Supreme Court (In re M.M.). At my Coffee Talk at Loyola Law School (March 14, 2018) with friends and colleagues I supervised over the years (from left Emma McMullen, Mary Bird, me ( Diane Redleaf, center), Stacey Platt, and Anita Weinberg. Ms. Redleaf has received prestigious awards for her role in mentoring dozens of other child welfare and public interest law leaders, including the Chicago Bar Association Alliance for Women Founder's Award (2014) and the Carleton College Distinguished Alumni Achievement Award (2016), to name just a few. Through her work as co-chair of United Family Advocacy and her work at Family Defense Consulting, Diane continues the powerful advocacy she has done throughout her distinguished legal career, including as the Founder (in 2005) and the long-time Executive Director/Legal Director of the Family Defense Center. Diane left her position as the Legal Director of the Family Defense Center on October 31, 2017, after stepping down as its Executive Director in July 2016. Diane's family members are her strongest supporters and her inspiration. They are her son Jonathan Libgober, husband Anatoly Libgober, and son Brian Libgober, Jacqueline Vayntrub, Brian's wife, is pictured below with Brian. Diane L. Redleaf, child welfare and family advocate for over three decades. Diane received the 2015 Family Defender Award at the 10th Anniversary Gala for the Family Defense Center, the organization she founded in 2005 with major support of her philanthropist and social justice pioneer parents, Rhoda and Paul Redleaf. In 2014, Rhoda was given a lifetime achievement award by the Family Defense Center. In 2016 Paul was awarded its Catalyst Award, jointly wiht his receipt of the President's Award from the Minnesota Civil Liberties Union (MCLU) in April 2016, at a special event co-sponsored by the Family Defense Center and the MCLU. Rhoda has led child development programs at the local, state and national level (and had a child development press, Redleaf Press named for her). After a long career in medicine followed by a second career as an option trader, Paul helped to create two racial justice projects in Minnesota through the MCLU and has served on numerous other boards. Paul and Rhoda have also initiated internship programs for college students at Carleton College (Diane's alma mater) and Sarah Lawrence (Rhoda's alma mater), benefitting dozens of students the social justice/advocacy organizations at which they have worked.